as the wine cork turns: gems for the win. 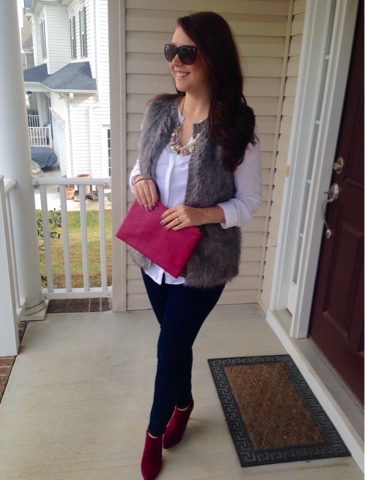 vintage necklace via cs gems | white blouse | faux fur vest (only $17.99)| clutch (sold out) | wine booties (on sale for $35!) 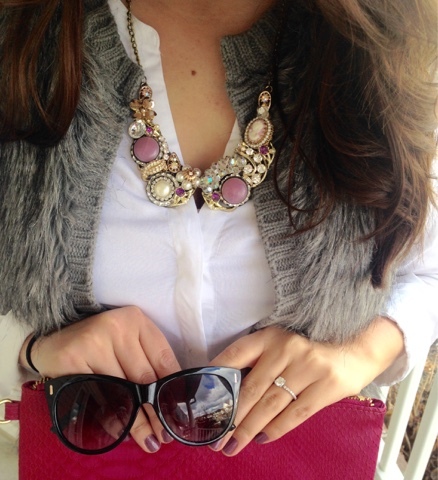 when i saw this necklace on cs gems' instagram, i kept thinking of how easy and fun this would be to style. cs gems has vintage inspired re-purposed jewelry that they put their personal touch on. i've worn the necklace out and gotten so many compliments on it as it's so different! my eyes are now on these gorg earrings - hey lee! there's a stocking stuffer idea for you. or maybe i could sneak it into my own stocking. growing up we never had stockings, so excuse me if i go stocking crazy this year. 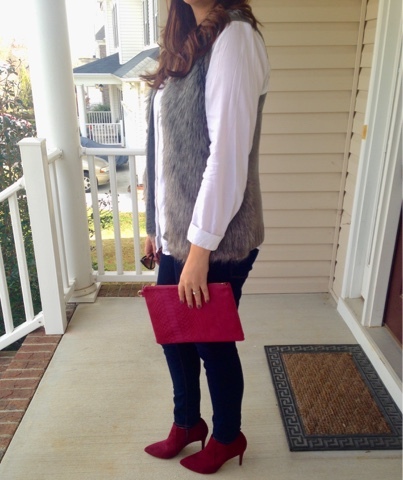 i kept the rest of this simple as the necklace is such a statement piece. 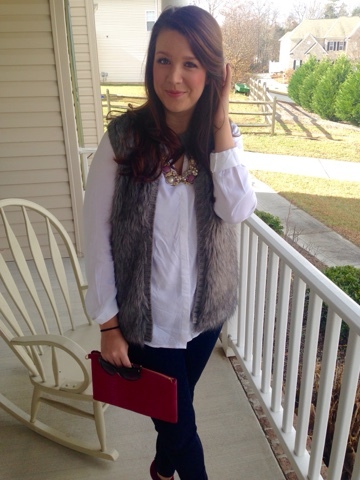 i'm loving these faux fur vests from target - i have the gray and white - the tan is still screaming my name. 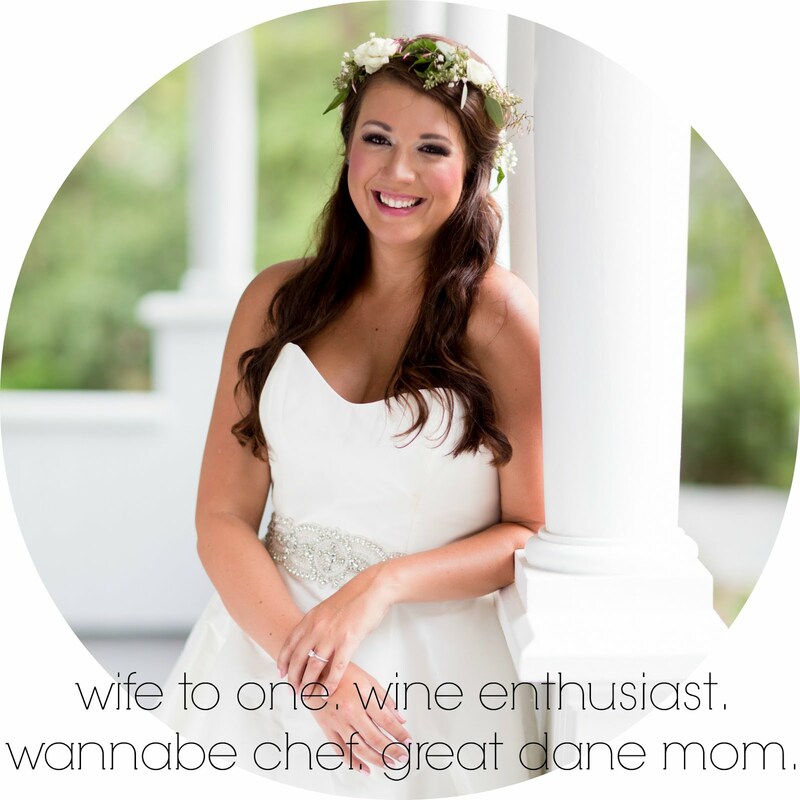 today, we're getting our christmas tree and heading up to hickory to see my maid of honor, danielle! we have a jam packed weekend coming up and i'm putting off the fact that this girl needs to make some time for christmas shopping instead of waiting until the week before like i usually do.